AMSTERDAM DANCE EVENT EXPECTS RECORD BREAKING EDITION! ADE’s renowned festival makes Amsterdam one of the busiest and most inspiring clubbing cities in the world. This year’s program covering the whole spectrum of electronic sub-genres, with more than 2.200 artists performing in 140 of Amsterdam’s finest music and nightlife spaces, including major venues like Melkweg, Paradiso, Westergasfabriek, the Concertgebouw, Heineken Music Hall, Ziggodome and NDSM Wharf, and the city’s newest hotspots Claire, De School and Shelter. ADE’s multiple conference streams connect the worldwide music industry, offering the ultimate annual business and inspiration platform in the field of electronic music. Divided into nine themed programs, ADE’s comprehensive conference covers every aspect of the modern music industry, featuring dedicated programming for business professionals, start-ups, aspiring producers and musicians, students, VJs, visual artists and stage designers. The programs also feature in-depth expertise and insight into the harder and urban music genres, the connection between dance & brands, the relationship between music and technology, and sustainable, ecologically responsible practices for the global dance music industry. ADE, an initiative of Buma, has secured the contribution of several prominent speakers. Among others, the artists Joris Voorn (NL), Laurie Anderson (US), Philip Glass (US) and Nicky Romero (NL), plus Rob Newlan (GB, EMEA director Facebook Creative Shop) and Matthew Ogle (GB, creator Discover Weekly Spotify) will expound on their work. These new names join previously announced speakers including Steve Bartels (US, CEO of the Def Jam label), Molly Neuman (US, Head of Music Kickstarter) and producer Hudson Mohawke (GB) at the conference, which welcomes a total of 450 speakers at eight venues. To see the full programme visit amsterdam-dance-event.nl/program/conference/events/. As well from the extensive night program and the various conference elements, ADE Playground presents a comprehensive and profound cultural program at 40+ locations all over Amsterdam. The five-day series of events consists of pop-up stores, hardware workshops, lectures and master classes, as well as photography exhibitions, fine art, films and documentaries, all of which reflect the many faces of global dance culture. One of the ADE Playground’s most popular elements, the ADE’s MusicTalks series, is set to be bigger, broader and more inclusive than ever this year. In just four years ADE MusicTalks has established itself as one of the most inspiring events at ADE Playground, providing a real interface between the music industry figures who visit the city during ADE and the tens of thousands of fans that gather for ADE Playground and the Festival nights. The 2016 ADE MusicTalks line-up includes Joe Claussell, Francesco Tristano presenting P:anorig, Joris Voorn, Jay Hardway, Octave One on Breaking Down the Mothership, Richie Hawtin and Matador presenting a MODEL 1 Masterclass, DJ Dano, Laidback Luke, plus Oliver Heldens, Daniel Miller and Noisia. And alongside that, besides their special performance at ADE, both Laurie Anderson and Philip Glass will host a MusicTalk. 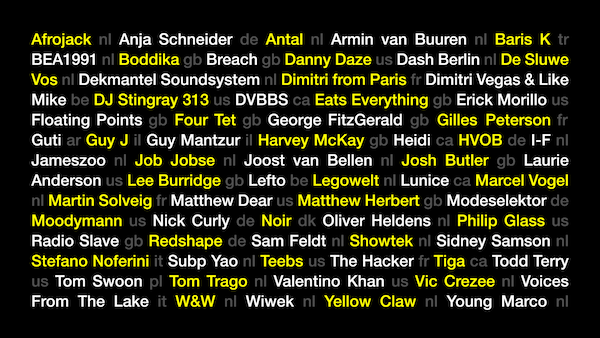 If you’re planning on visiting ADE’s Festival or Playground make sure to grab the annual ADE Card which costs just €10. Creating is the central topic of ADE: virtually all of Amsterdam’s recording studios are booked for the third week of October for the production of new tracks; live electronic music is performed at ADE LIVE; new technology presented and created; and new collaborations forged that will determine the musical landscape of 2017 and onwards. The program of ADE 2016 is extensive in scope and depth, allowing each visitor to navigate his or her personal trip through the world of dance, from the city camping and student education of ADE University at NDSM Wharf via the Rembrandthuis to Amsterdam ArenA and the Bible Museum.